Summary and Definition: The Osage tribe, originally a woodlands tribe, inhabited lands midway between the Mississippi River and the Great Plains and between Canada and New Orleans. The Osage were a fierce, war-like nation who were Missouri's greatest Native Indian traders when they were encountered by the Lewis and Clark expedition (1804-1805). What was the lifestyle and culture of the Osage tribe? The Osage called themselves Ni-U-Kon-Ska meaning "Children of the Middle Waters"), but were known as "Wah Sha She" by most whites at the time they were encountered by the Lewis and Clark expedition (1804 - 1806) when they were referred to as the "the great nation South of the Missouri". The people of the tribe were strong and unusually tall. Warriors were extremely swift-footed and were known to travel up to 60 miles in just one day. The above picture of an Osage warrior was painted by the famous artist George Catlin (1796-1872) who described the brave as wearing "a profusion of wampum on his neck, and a fan in his hand made of the eagle's tail". The fierce, powerful, war-like braves wore striking red face paint and shaved their heads except for a scalplock (one long lock of hair in back) and wore a porcupine roach headdress on top. 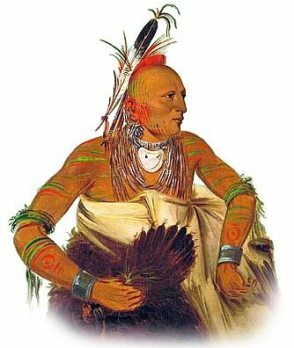 The Osage were great traders and fought on the side of the French in the wars with the British. They acquired flintlock muskets and sharp tomahawks from the Europeans early in their history which made the tribe formidable military opponents to many other Native American tribes. The Louisiana Purchase (1803) the 1808, the Osage signed the Drum Creek Treaty in 1868, ceding almost all of Missouri, to the United States. The Osage later became scouts for the U. S. Army. Where did the Osage tribe live? The Great Plains Osage were woodland farmers but adopted a nomadic lifestyle, hunting the great buffalo herds and living in tepees made of buffalo hides. What did the Osage tribe live in? During the summer the Great Plains Osage hunted for buffalo using tepees as shelters, but their permanent homes were originally large fortified villages of thatched longhouses. What language did the Osage tribe speak? The tribe spoke in the Dhegihan dialect of the Siouan language, closely related linguistically to the Sioux and the Stoney tribe. What food did the Osage tribe eat? The food that the Osage tribe ate came from the animals they hunted on the Great Plains including Buffalo, elk, deer (venison), black bear and wild turkey. This food was supplemented with roots and wild vegetables such as spinach, prairie turnips and potatoes and flavored with wild herbs and dried buffalo meat called pemmican. The Osage farmers produced beans, maize and squash supplemented with pumpkin. What weapons did the Osage use? The weapons used by the tribe included muskets, lances, knives, hatchets, tomahawks and strong bows and arrows made of Osage Orangewood. What clothes did the Osage wear? The men of the tribe wore breechcloths, fringed buckskin tunics or shirts and leggings. Warm buffalo robes or cloaks were also worn to protect against the cold and the rain. The women wore buckskin knee-length dresses and leggings and buffalo robes during bad weather. Osage History: What happened to the Osage tribe? The following Osage history timeline details facts, dates and famous landmarks of the people. The Osage timeline explains what happened to the people of their tribe. 1750: The Osage defeated the Caddo tribes to establish dominance in the plains region with control "over half or more of Missouri, Arkansas, Oklahoma, and Kansas".